I spent the years 1961 to 1968 watching the changing scene on the WCML at Coventry(tile hill)everything from Duchesses and Brits to diesel and electric traction. But.by far and away my favourite haunt was Dorridge station on the Snow Hill-Paddington line a seven mile bike ride in all weathers as i recallbut well worth it for the atmospheric air the location had in those days.Have not been back for forty years and now i must go for one more look thanks to RAB rekindling those childhood remories.Many Thanks. Thanks Dave, it's receiving comments such as yours that make the project seem all the more worthwhile. Lovely site I used to go to see the 8.30 train (namers usually) at Crossfield road overbridge on a roundabout way to school in the late 50's. As craftsman with the MEB I worked at the substation by the bridge. Great site, used your main map and Google earth to trace some of the lost lines in The Black Country. I was working at Wton a few Saturdays ago and noticed you come through buy the time I got out you had gone and my colleague informed me you had asked about R.Court he retired about two years ago. Thanks for the entry Simon, have to put an end to the rumour though - I'm not the Andrew Doherty associated with Wolverhampton station . . . although I did work at Kings Norton station some years ago. i have just come accross you web site and have found it a real pleasure to look at the old photos of the region i also remember you being my station manager at wolverhampton. Having lived in the Water Orton and Coleshill areas many years ago and also worked on the railways in the Birmingham area I have found this site fascinating espesially as I havent visited Birmingham for at least 10 years. Keep up the good work as I shall be a regular visitor from now on. I was looking for photographs of my old local stations of Willenhall and of Wednesfield on your site and thought you might like to hear some of my silly little memories. As a small boy I remember travelling from Bilston Street Station to Wolverhampton every Saturday with my Sister, my mom and 3 of my aunts.I can also remember travelling on an excursion from there, perhaps to Blackpool(?). I was so disappointed when the station closed. I also remember being taken to Noose Lane Level Crossing,via the Dartmouth Avenue entrance to Willenhall Memorial Park. 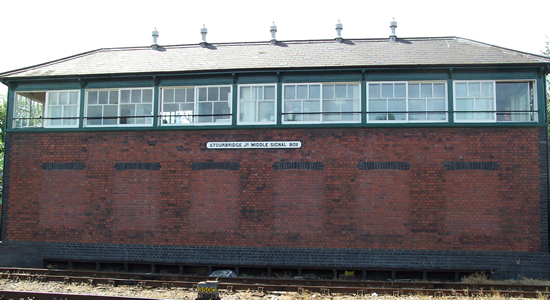 As we passed the tennis courts we would often hear a goods train start from the old Midland Station and I would runs as fast as my legs would carry me to watch a dirty black steam engine emerge and dive under the railway bridge (we called it "The Iron Bridge" and it is still there) and out of sight towards Wednesfield. At Noose Lane more often that not what I now know to be a 2-6-tank engine would rattle past in the direction of Wolverhampton. The crews would wave to us from the footplate if they saw us. I note your comment about the site of Wednesfield Station and remember my Aunts telling me that they would travel from Willenhall to Wednsfield by train to visit an aunt. When I asked her when this was all she would say was "Oh, it was a good many years ago". She also maintained that the driver would wait for them if they were late and had been known to stop the train so they could board. Could you imagine that now? No nor me! I did a fair bit of trespassing in the closed Willenhall Midland station, including climbing on the gantry crane and trying to pull levers in the signal box. I can still remember the weighing machinery and a great deal of papers lying around in the goods shed. I will add that I was probably about 7 or 8 at the time and was "spotted" by another aunt in the act! In the 1970's a friend and I went to photograph Wednesfield Signal Box only to find that it had been burnt down (or otherwise demolished) and funnily enough the same thing happened when we went to do likewise at Wolverhampton South Box at Low Level Station. Peering over the Sun Street bridge all that was left was the shape of the base. I'm glad to say that we managed to "preserve" a couple of items from the area including a distant signal arm from between Willenhall and Wednesfield and one of Low Levels Home Signals. Hi, Born 1950, I used to live close to the B'ham - Coventry line between Lea Hall and Stechford. I used to spot trains by the Iron Horse pub on Flaxley Road (on some waste ground next to the Sea Cadets premises, HMS Dolphin). Also used to sit on the high bridge at Hill House Lane. (some idiotic children would balance and walk along the parapet, inches from a 50 foot drop to the tracks !!!) Strong memories are the "somersalt" signal giving entry to the goods yard at Stechford - now an industrial estate,- and the inevitable Ivatt class 2 2-6-0 using the hump to shunt the yard. We had 'Sunday Diversions' when the Trent valley line was being electrified in the '60's, which meant that diverted London to North traffic went via Rugby - New St. - Wolverhampton - Stafford. Some traffic avoided New St. going via Stechford, Aston, Witton, Bescot, Darlaston, Portobello Junction and rejoined the Wolves - Stafford line at Bushbury Junction. This was heaven as we had a procession of 'namers' to spot, the highly regarded 'Semis' and Scots' passing regulary. I love this site as it adds to my own research into the railways of the area, a subject I contiune to find absorbing. PS, I belong to the Nuneaton Railway Circle, and I highly reccomend the club and it's activities to anyone interested in railways in general.